Recently I published an article on a great little backpacking stove made from a cat food can. That tip came from my experience in lightweight backpacking, an area I follow closely and am very active in. In this article, I am going to show you how I cook on the trail. It involved a little preparation and some forward thinking, but I know being a prepper, that’s nothing new for you! I’m always looking for ways to crossover my knowledge, skills and equipment between both backpacking and prepping. There are many similarities and pieces of gear that are suitable for both activities, however one stands apart as a great idea if your plan is to bug out and head for the hills, forest or a destination that requires travelling on foot. Simply put, we are taking the humble freezer bag, adding your own pre-made dried food and turning it into a vessel that will allow us to rehydrate our meals quickly and easily whilst on the move. There are many benefits to this method of cooking, but first lets take a look at how it’s done. First up for any trip or bug out, you need to know roughly how long you will be hiking and how many meals you need. If your aim is to get to your destination in the quickest amount of time, I suggest eating something quick for breakfast, that doesn’t need cooking. Things like granola bars are great for this. So that leaves lunch and dinner, and my plan is to use a bunch of trail mix, nuts and seeds for lunch. A small back will pack around 2,000 calories and is plenty for snaking throughout the day. So that simply leaves us with dinner. My first tip is to pack what you eat. There’s nothing worse than arriving at camp cold, wet, tired and hungry and eating crap you would never eat in a non-shtf situation. If you’re just staring out, I also suggest packing store bought dried good. Things like instant rice, instant mash potato, couscous etc are all great staples that will allow you to go light and pack some good calories. Now you’ve decide on your meals you need to get them prepared. This is often as simple as dumping it all into a freezer bag (the actual freezer grade bags, do not use the thinner/cheaper bags). If you have ingredients that won’t mix well together, you can store them separately, but I have never had a problem mixing all of my dried ingredients into a single freezer bag. Make sure you mark out the meal on the front of the bag so you know what’s inside and how many portions. 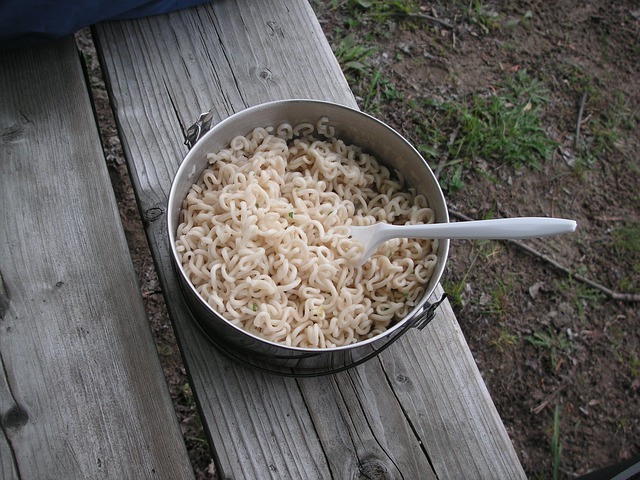 When you get to camp, you should try to get your water on the boil as soon as possible. Depending on what you’ve packed in your freezer bags, it could take 30+ minutes sometimes to rehydrate you meal. I use this time to set up my camp, collect wood, water and make shelter. So you warm up your water, if using fresh water that doesn’t need boiling then it also doesn’t need to reach a rolling boil, just hot water is fine and will do the job. Once the water is hot, add your bag of food to your pot or cozy and add the water. Often it is 1 cup of food to 1-1.5 cups of water, however you should add the water a little at a time to gauge the correct amount. Then zip up the bag, add the lid to your cozy and allow to rehydrate, checking at 5-10 minute intervals and mixing the food and water with your hands by squishing the outside of the bag. Now for the best bit! I like to unzip my freezer bag once the food is ready and fold over the edges of the bag around my pot so I don’t have to hold the hot bag. Some people opt for a long handled spoon to save them from getting food onto their hands, however I prefer a normal sized spoon and to just roll the bag down a bit at a time to raise the food up towards the top of the pot. In this video by a well know ultralight backpacker, you will learn how to make your own freezer bag cozy to rehydrate and cook your lightweight food.